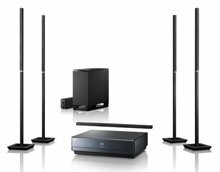 So you’ve got your 9.9mm LCD TV from Sony – it’d be a shame to spoil it all now with some fat speakers, wouldn’t it? These new speakers from Sony are just 16mm thick, and were wonderfully codenamed ‘Pocky’ after that delicious Japanese biscuit/chocolate/confectionery thing. Officially and less imaginatively titled the BDV-IT1000, the main control box houses a Blu-ray player which will also upscale normal DVDs. Should you be a fan of the extra features that comes with Blu-ray Live, you’ll find the player compatible with that as well.